Go Professional For Your Skin With Revision Skincare! You are here: Home / Sponsored / Go Professional For Your Skin With Revision Skincare! Revision Skincare allowed us to try some of their products to share the information with you. Did you know that skin is the largest organ in the body? It protects us from all environmental factors. And we need to take care of it just like we do the rest of our body. Using premium skin care products can help to prevent the signs of aging and keep skin healthy! Why purchase skin care products from a dermatologist or skin care professional? Professionals evaluate your skin during consultations so you are assured that the products you are using are the best for your skin type and concern. While buying skin care products in a drugstore, department store or online is convenient, there is no one who evaluates your skin to determine if what you are buying is what you need or should be buying. Revision Skincare is based in Dallas, Texas. They own their own manufacturing facility so they are able to control every step of the manufacturing process–from formulating and testing to manufacturing and shipping. Revision Skincare products are sold exclusively through medical offices. The staff at the Dallas Center for Dermatology and Aesthetics is professionally trained in Revision Skincare products and will analyze your skin for your best products. 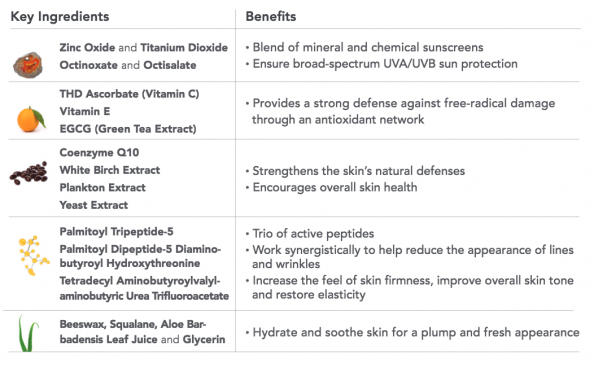 Everyone should be using a good sunscreen (extremely important to people in high sun areas) and for best results the SPF product should be coupled with antioxidants. 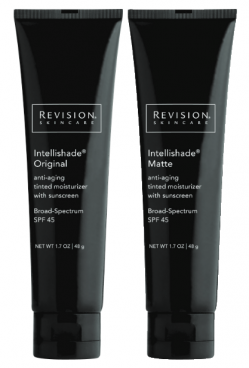 Intellishade from Revision Skincare is a best-selling, award winner 4-in-1 anti-aging tinted moisturizer with SPF 45 and antioxidants. Intellishade is ideal for all skin types. The matte version is especially good for normal to oily skin. While the original is especially good for normal and dry skin. It is an excellent 3-in-1 daily moisturizer for those with busy lifestyles as it conceals, correct and protects in one step. Intellishade is loaded with potent peptides, antioxidants and botanical extracts that work synergistically to combat aging while keeping skin moisturized and protected. Intellishade also has a SPF 45–and you would never know it because of how aesthetically elegant the product is. Available in two finishes–personal preference. Matte is oil-free which is great for those who tend to be more acne prone. You can also mix the two finishes to create your own custom blend! Intellishade Original won a NewBeauty Beauty Choice Award, voted best sunscreen sold in a doctor’s office. This was voted on by NewBeauty’s readers and beauty experts. For more information visit the Dallas Center for Dermatology and Aesthetics or visit the Revision Skincare site.